I've had a great, quiet, relaxing one. This week will probably be a relaxing one too as it's spring break for the kids. Jasmine will need to catch up though, she's fallen quite a bit behind, but truthfully I can't blame her as the work load for high school is just incredible. 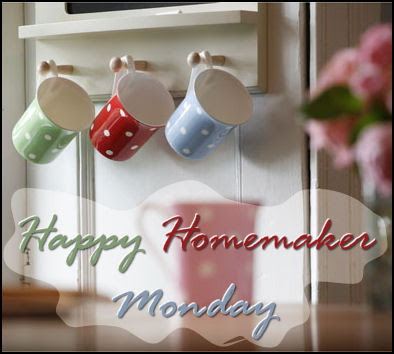 Anyway, let's get on with our Happy Homemaker Monday. 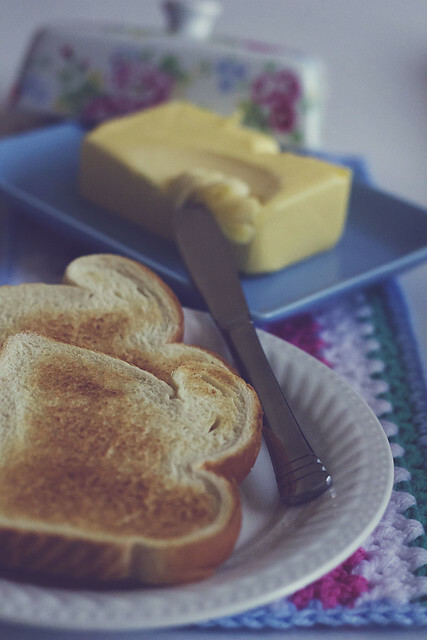 Coffee with the Caramel Macchiato Creamer and two pieces of toast with Irish Butter. Cloudy, dreary, but wonderful. I do love a good rainy day. Trying to multitask, typing up this post, checking email, looking over the kid's schooling. I was sitting here this morning actually looking around and thinking that I will miss this little house. When we first rented it, I was so excited because it looks like a farmhouse, and I love the living room and the fireplace. I envisioned many years spent here with my family, and to think that I have to leave it and find another house soon, makes me kind of sad. Just got in another book for review, it's called "Running Fire". Need to get into that one soon. Also still have the other one about Pasta making coming in. There is something so cozy about snuggling in when it's rainy, especially when you know you don't have to go out in it. I love your photo and the pretty jar I'm guessing you made (talented lady). Hope you do have a wonderful spring break and I hope that you can get excited about the new adventures ahead, and try not to get too down about leaving. Prayer & hugs always. ps tens visto a nova novela... a unica mulher?? That photo of the candle is so beautiful. I absolutely love it. I hope that you are all doing ok with the move and things. I know it's sad and rough, but maybe there is something even bigger and better in store for you. I love your photo. I hope you enjoy your spring break and that you will find a house you love just as much if not more when you move. 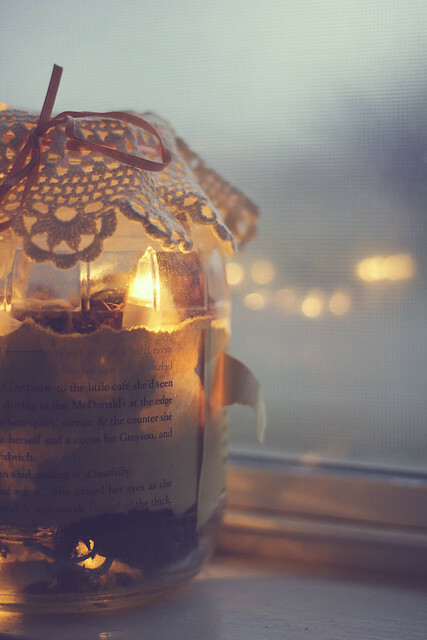 I love the photo of the candle, it's so calming. I had been going through your Slow Cooker Thursday recipes, and have tried quite a few of them, and they are really good. But I have to tell you the Chicken Parmigiana is the best, my mom tells me how good it is every time I make it. The only thing I do differently is I take the chicken out of the crock pot and put the chicken in the oven with the cheese on top for about 20 minutes. So delicious!! I know with your move you aren’t blogging as much, but just wanted you to know that I have been visiting often, and getting a lot of good recipes!! I love your photo! What is it? Looks a bit vintage with the newspaper on it. Would love to know more. Oh how I wish we had cloudy or rainy weather here, but alas not going to be the case. Just more sunny days and 80s by the end of the week.